A worksheet that quickly reviews regular past tense verbs, introduces 6 irregulars, and has a writing and interview section. 1. 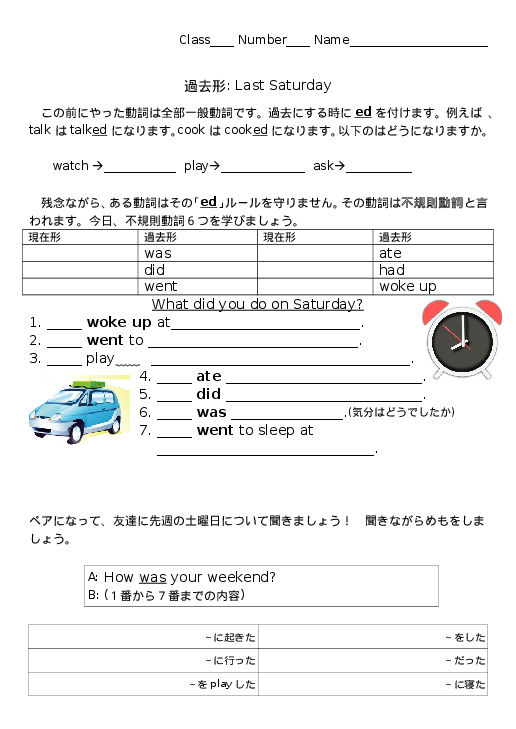 Pass out worksheet and review the regular past tense. Have students conjugate the first 3 verbs. 2. Read and repeat the irregular past tense verbs. Have the students try to guess what the verb is in the present tense. Reveal the answers, and have the students copy them onto their papers. 3. Have the students make sentences with the verbs, describing what they did last Saturday. * This section can be too difficult for 2nd year students. Writing alone might still be a challenge, and coming up with original sentences may be too much. #5 may be a bit difficult as well. "I did homework" is an easy answer you may wish to give them. 4. If you still have time, have the students interview a partner about what he or she did on Saturday. They may take notes in Japanese about it in the table. 5. After interviewing a partner, the students may be instructed to write out what their partners did on Saturday in English. * This is most likely far too hard for 2nd year students. After a few classes they might be able to do it as homework, or it might be best just to skip this part. This is too hard for many second year students. You may wish to use it as a review worksheet for 3rd year students.